Following the Student Union’s Friday release of its Community Emergency and Enhancement Fund grants for the year, this board would like to commend the CEEF committee on its foresight and its commitment to transparency, as demonstrated by their public announcement of the initiatives. When the CEEF originally replaced the Student Union’s Capital Expenditures fund in March 2014, the Union planned to spend an annual $200,000 of the $250,000, according to a March 1, 2014 Justice article on the subject. This past week, the University held a panel showcasing a variety of female leaders in the workforce and their impact on women’s empowerment in such a space. Beginning March 23, the University hosted a two-day symposium titled "Black Lives Matter: Local Movements, Global Futures." The symposium sought to help Brandeis students relate their own experiences with the Black Lives Matter movement to those of other activists on a global scale. Midterms, BranVans, housing — these are the things that stress Brandeis students out from year to year. On Monday, March 13, the Brandeis community received an email announcing the #1Gift1Vote Challenge, a fundraising campaign that gives members of the community an opportunity to show their “passion for a program that is the most meaningful” to them. The 2017 election for president of the Student Union has yielded three well-qualified candidates, all of whom share worthy goals and an admirable passion for the University. This past week, the University began its search for a tenure-track professor in Astrophysics. The University has emphasized its efforts to recruit and hire faculty of historically underrepresented groups, a practice which we strongly commend. Last Tuesday, the Senate confirmed Betsy DeVos for education secretary by a 51-to-50 vote. Vice President Mike Pence cast the tiebreaking vote, marking the first time in history that the vice president acted as a tiebreaker for a cabinet nomination. This board urges the University and the Education Studies department to take note of DeVos’ confirmation and begin to devise ways to counteract the damage her tenure will have on elementary, middle, and high school students — inevitably members of future incoming classes at Brandeis. An update to the University’s Dining Services website on Aug. 2, 2016 declared that Dunkin Donuts would be moved from its location in the Village to Upper Usdan, to be opened at the beginning of the spring semester of 2017. 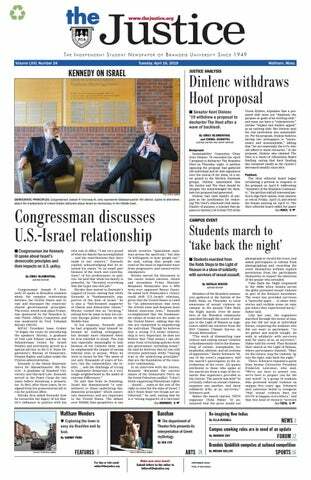 The Task Force on General Education has proposed several changes to the current general education requirements for Brandeis undergraduates, according to a Jan.